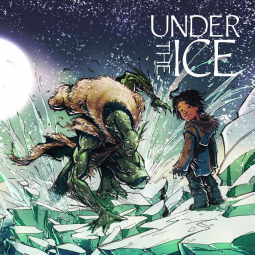 Today’s review is for Under the Ice, written by Rachel A. Qitsualik, illustrated by Jae Korim, with a forward by Babah Kalluk, published by Inhabit Media. I received an electronic copy of this book through NetGalley in exchange for an honest review. Under the Ice is based on a traditional Inuit story about an old woman whose grandson is carried off by the qallupaluit. The quallupaluit are strange creatures who live beneath the ice, and stories about them have long been used to scare children into staying away from the shore. In the forward, Kalluk explains that “Inuit stories are magical, strange, and often scary”–and that kids today are exposed to fewer of them due to the emergence of movies, cartoons and comics as preferred mediums for entertainment. In order to compete, this book pairs a traditional story with bold comic-book style illustrations–an artform that should appeal to the target audience. Qitsualik does an outstanding job in retelling this tale. Her prose is clear and simple. It leaves you with the sense that she could be sitting beside you reciting the words. For me, she captures the feel of the oral tradition in her writing. And I like that, because it’s one more way to try to keep the younger generation connected to this traditional culture. Being simple and clear doesn’t mean that the writing isn’t beautiful–quite to the contrary. There is wonderful imagery and figurative language skillfully woven into the narration. Korim’s illustrations are top notch. He primarily works in a palette of muted blues, grays, and browns that capture the visual environment of life in the Arctic perfectly. You can almost feel the coldness of the ice through the page. His rendering of the qallupiluq is truly frightening. My only complaint about the illustrations is that there weren’t enough of them! By which I mean, the book is absolutely wonderful as is, but I loved Korim’s art so much that I would have loved to see even more. Inhabit Media has been impressing me with the quality of books that they are producing. They are an Inuit-owned publishing company with a mandate to preserve the stories and knowledge of northern Canada. I was excited to learn of them recently, and hope that I will be able to read more of their catalog in the future. Under the Ice is certainly worthy of a full 5 star rating. I would love to have a copy of this book for my personal library–and think it would be a great addition to any local or school library, as well. For the children of Nunavut, it provides a chance to connect with their traditional culture in a new way. For other children, it provides a great opportunity to learn about a different culture through their own stories. You can find more information about this book, including other reviews, at Goodreads. Today’s book review is for Joy of Apex, by Napatsi Folger, published by Inhabit Media. I received an electronic copy of this book through Netgalley in exchange for an honest review. Joy of Apex is the debut novel of author Napatsi Folger. It is written in the style of first person narrative delivered by titular character Joy Magnussen. Joy is a 10 year old girl of mixed Inuit and Scots-Norwegian heritage who lives in Apex, a small suburb of Iqaluit in the Canadian territory Nunavut. She lives with her parents, an older brother, Alex, and a younger sister, Allashua. The novel follows Joy as she confronts tween horrors like school presentations, hair disasters, and getting grounded–all against the background of her parents’ failing marriage. For the most part Joy’s story is that of a fairly typical 10-year old. She likes to play outside with her friends, draw pictures, and watch cartoons. She has a crush on a boy and picks on her little sister. At the same time, she lives within a specific culture and those markers come up from time to time. In one scene, her family eats bloody caribou meat (a favorite treat). At Halloween, Joy dresses up as a Qalupalik–an Inuit ice monster that devours children who wander too close to shore. Another time, she relates a story about when she was a baby riding in her mother’s amauti. 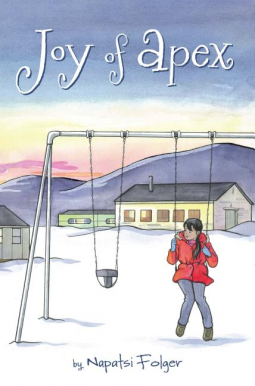 In this way, Folger invites young readers to observe that despite some differences, modern Inuits live lives that aren’t all that much different from those of families in other parts of Canada or the US. Although Folger’s style still carries some flavor of a rookie writer, she demonstrates a lot of promise. It can be challenging to write a child’s voice in the first person–too often the adult voice of the author comes through too strongly. Fortunately that is not the case here. The narrative voice of Joy is strong, distinctive, and believable. While I was reading, I was repeatedly struck with a strong desire to live in Apex, myself. Folger’s descriptions make the town come alive. I could imagine myself as a youth once more, playing a game of Over Andy with the neighborhood kids. There are so many small details woven in: from the town being so small that the children know the school staff on a first name basis, to the end of summer being marked by frozen dog poo under the swings–Folger paints a vivid picture of life on the tundra. Finally, Folger does a good job with the pacing of the story. She alternates sections of drama with lulls where we get a window into the every day. But she doesn’t linger too long in the lulls, instead cutting soon enough to a new event. The book was well-designed, as well. Ann Kronheimer’s chapter illustrations were full of personality. Typefaces fit the tone and style of the story and are easy to read. Text size seems appropriate to the age level of the target audience. My only real complaint is that the formatting at the start of each chapter didn’t really work for me. Even with the initial drop cap, the lack of indentation gave me a sense that I wasn’t beginning my reading where I was supposed to. In the final analysis, I really enjoyed this book. I was a little unsure going in–but in the end Folger won me over. This novel is a great touchstone book for middle grade readers in northern Canada who are underrepresented in children’s literature. It’s also a great book for exposing children from other parts of the world to Inuit culture. Additionally it could be a good selection for a child who wants to explore books that deal with issues of divorce or mixed racial identity. I’m giving it 4 out of 5 stars. The story engaged me. It felt authentic. There were strong characterizations. There was an excellent sense of place. Maybe the writing wasn’t flawless; it was still pretty darned good.